When we got the opportunity to test the latest Pirelli RIB, we thought it was going to be just another pleasant ride on the latest toy. What we met was a monster of a boat, a rubber beast whose stylish exteriors hide smart solutions and engineering tricks. Built for fun days at sea, the 1900 has a wide open deck, comfortable interiors and is extremely easy to handle. We were lucky the boat was chaperoned by one of Pirelli’s skippers, who was more than willing to tell us everything about it. He told us one of the reasons Pirelli 1900 is so fast and maneuverable is the easy trimming system, allowing the skipper to choose the setting that best serves him or the conditions: Cruise, Sport or Rough Sea. The system uses the Top System T65 surface propellers to automatically adjust to current needs. Technical data state top speed of the model at 45 knots, but we reached 44 knots on our test – with ten people on board. The skipper recommended 27 knots for comfortable cruising, adding that doesn’t change even at rough sea. Seeing how the unit we tested was powered by two 800-hp MAN engines, we must say the engineering did a stellar job at taming the beast: we tested and tested, but the 1900 remained calm and smooth no matter what we threw at it. 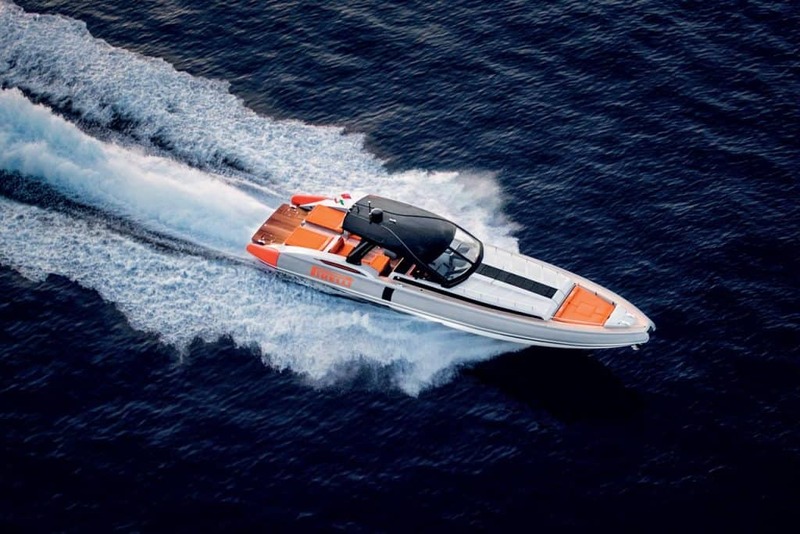 One thing we all immediately liked – even if it was just a cute touch, and not at all essential – was the steering wheel that automatically resets itself centrally, like in cars, but what truly impressed us was the hydraulic bow thruster. As we were sailing back into the harbor and maneuvering, the bow thruster, connected to a joystick and the automatic trim adjusting system, did most of the work and maneuvering proved easy enough even for beginners. 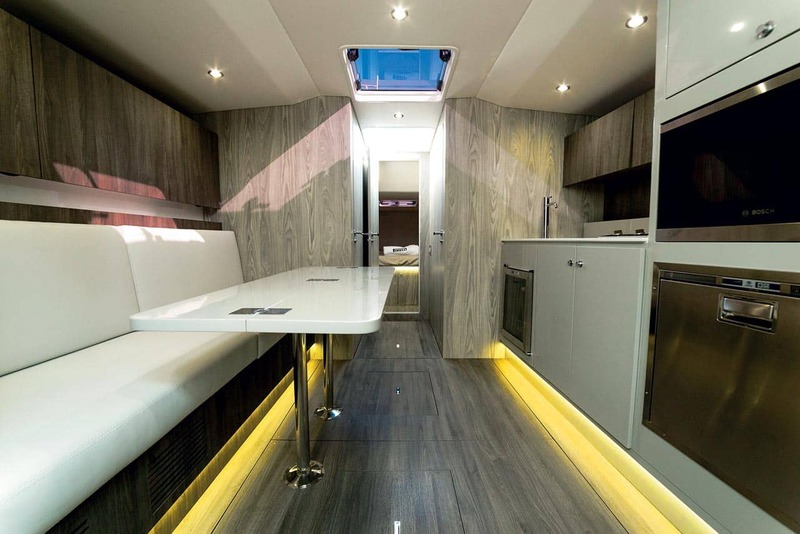 Below deck, the basic layout features two cabins, a living area with galley, dinette / bed and dining table. The master cabin is in the bow, and the other cabin is aft, as are the head and a technical area which alternatively can be replaced by a crew cabin. The famous Pirelli pattern graces the rubber sides of this model as well – it is the very design of Cinturato Blue Wet, used by Pirelli in the top automotive races.